SLS Academy Announced as Award Finalist from International Home Staging Trade Association! The Real Estate Staging Association® (RESA®) recently announced SLS Academy’s Client Care Package as a finalist for The RESA® Most Innovative Product or Service of the Year™. How exciting! SLS Academy will be exhibiting at the 2017 RESA Convention in Las Vegas Nevada at the M Resort Jan 19-21, 2017, where the winners will be announced and presented with their prestigious awards. This annual convention is a huge industry event and a great opportunity to connect with home stagers from around the globe! “We would like to thank everyone for their participation in the awards process, without the support of our membership we would not be able to recognize so may well deserving people in our industry. All of the finalists in all categories can be seen at www.HomeStagingIndustryAwards.com. All of the winners will be announced at RESACON2017 during the awards banquet January 19, 20, 21, 2017 at the M Resort in Las Vegas”, said Shell Brodnax, President/CEO Real Estate Staging Association. Learn more about this award-winning Client Care Package! 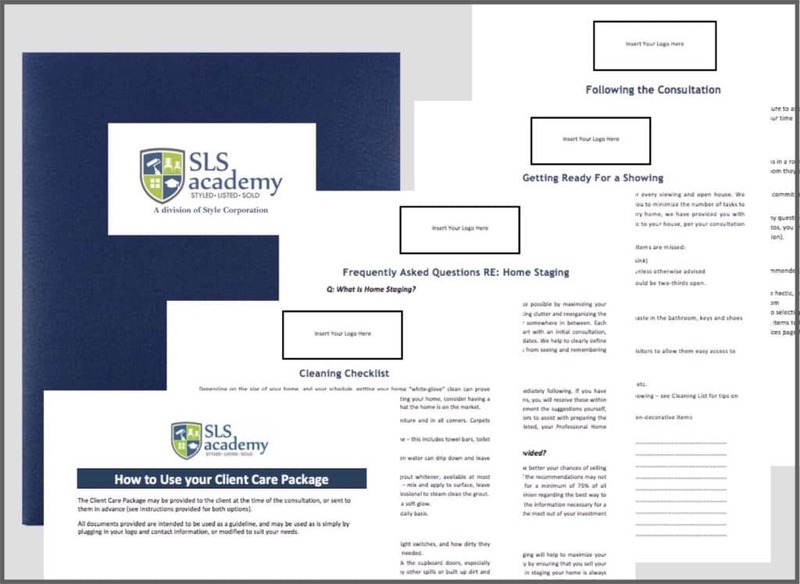 Inside the Client Care Package, you’ll receive access to tips and checklists to use for your clients and you to create the ultimate consultation experience, while helping you to upsell your services. All of the documents provided are in .doc format so you can edit them, and they’re completely customizable with your logo and contact information. Plus, there’s an included tutorial on how to use them!